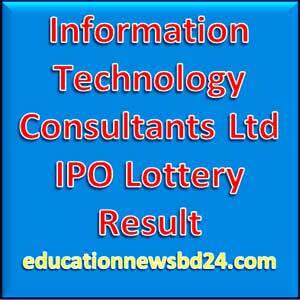 Download Information Technology Consultants Ltd IPO Lottery Result. Download Information Technology Consultants Ltd IPO Lottery Result has been published and fully updated here on today Thursday 03 December 2015. Time 10:00 A.M and Place: Engineering Institution, Ramna, Dhaka. Public offer for application of Information Technology Consultants Ltd was from 02 November 2015 to 12 November 2015. Information Technology Consultants Ltd IPO Lottery Result has been published and fully updated here on today Thursday 03 December 2015. Time 10:00 A.M and Place: Engineering Institution, Ramna, Dhaka. IPO or an Initial Public Offer (IPO) is the first sale of a stock by a private company to the public company. In this way, a company can increase money by issuing either debt or equity. IPO or Share market launch is a type of public offer in which shares of a company generally are sold to the recognized investors that in turn, sell to the general public by a securities exchange for the first time. In this way, a private company converts into a public limited company. IPOs are often issued by smaller or newer companies seeking the capital to expand, but can also be done by large privately-owned companies looking to become publicly traded. Information Technology Consultants Ltd IPO Lottery Result has been published. Download Information Technology Consultants Ltd IPO Lottery Result here. After ending of application of Initial Public Offer (IPO) from 02 November 2015 to 12, November 2015 of Information Technology Consultants Ltd IPO Lottery Result or Lottery draw will be held on Today on Thursday 03 December 2015. Place: Dhaka. Time: 11:00 pm. The business of the company inter alia includes online Switching Solution, Software Development and Service Provider of Q-Cash. Member banks shared ATM network. Q-Cash Transaction Processing and Service & Maintenance Products. Sales Products: ATM, POS Terminal, Kiosk, Bio Metric ATM Software solution, Switching Software Solution etc. Affected public (20%): 4,800 Lot. NRB (10%) : 2,400 Lot. Mutual fund (10%): 2,400 Lot. TOTAL SHARE (100%) : 24,000 Lot. Auditors: Hoda Vasi Chowdhury & Co.